Didn't mean to double post... I was just wondering if you were selling (or already sold) the Aria Pro II Thor? Thanks! The vintage Aria Pro II TS-600 is not for sale. 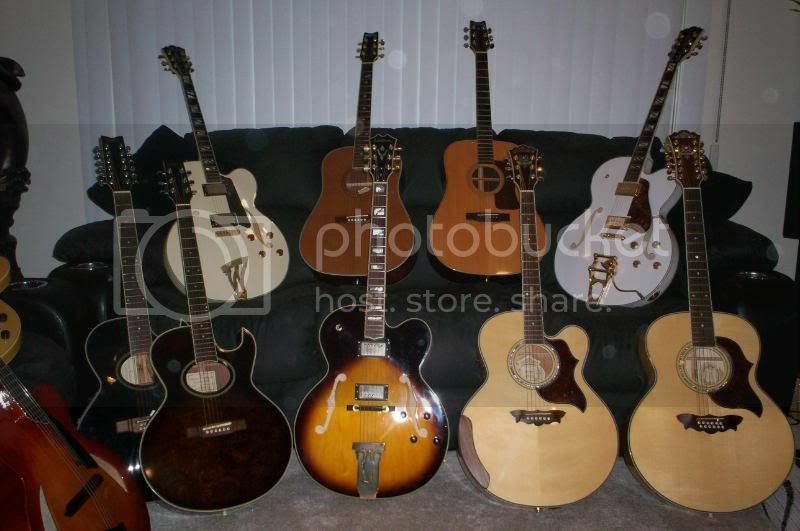 Im not sure if you're still wondering about the guitar on the right hand side of the white jazz guitar in pic? Think its a Washie D104SCE... ive just picked one up, gotta agree with you...so hard to find anything on the Washburn site for them. Anything you could tell me about yours would be great, maybe a pic?? I'll take a pic of mine shortly and post, we'll see if we're talking about the same sweet instrument ey? Can't work out the value here in Aust either, got mine scendhand but as new condition. im down the road in Melbourne! G'day squint, Just picked up a very sweet D104SCE secondhand but in brilliant nic. Don't know too much about the model, would love to pick your brain over it? Cant find much at all about it online. What can you tell me about it? have i found something special, cant find it on washburn homepage! !Struggling to find a price for it too. Am in Australia, have to exercise my brain for a US to AU conversion!!! thanks so much, talk soon? ?